No matter how you pronounce Obložené Chlebíčky aloud in front of person that was raised in Czech Republic or Slovakia, you will notice instant reaction: they will start to salivate like Pavlov’s dog, the eyes will start to get glassy and breathing will get faster in anticipation of incredible feast. Just like potato salad, which is used on some sandwiches as a base spread, it is an absolute must for Christmas, New Year’s Eve and Easter and at majority of Name Day celebrations. And, just like the potato salad, it is very tedious to prepare due to all the cutting and slicing. That, of course, is on top of making different base spreads for these jewels. Once you have the spreads prepared and gherkins, eggs and pimentos are sliced in traditional cuts, then it is just a question of assembly. Yeah, right, simple assembly...not! These sandwiches are nothing like what you see here in Canada or US. Here, the bread is covered with same flat ingredients end to end. 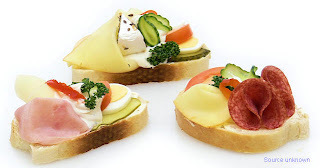 On Czech version, every slice of meat or cheese is shaped into cones, bow ties, rolls...Because of that, every bite has different taste and texture. 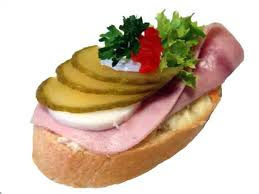 For example on my hot salami and cheese version in one bite you might have spicy and soft Hungarian salami and crunchy gherkin and other bite will have harder Swiss cheese and slice of pickled egg with mustard. 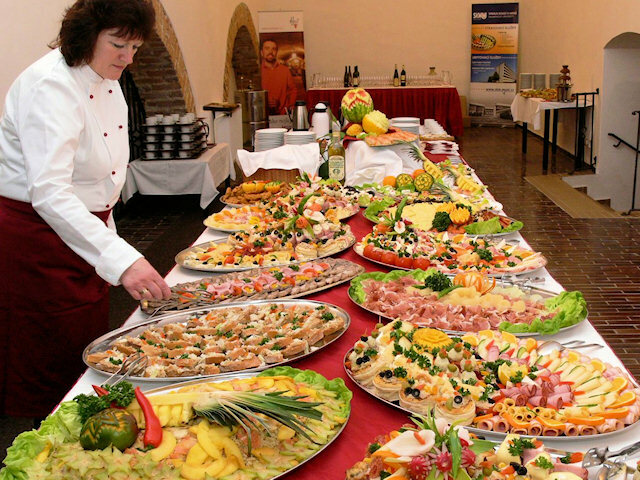 Every family, restaurant and caterer has their own combinations. Let’s start with spreads. Of course, you could use just a plain butter but why to take shortcuts when you want to prepare something incredible, ne se pas? Place everything in a bowl and mix with fork till smooth. Same as above but replace dill with 1 Tbs. Dijon mustard. 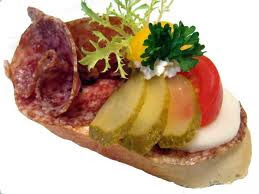 Shaved or thinly sliced ham, thinly sliced Hungarian or any hard salami, thinly sliced pastrami and/or Montreal meat, thinly sliced Swiss and Edam cheese, small chunks of Brie, Camembert, Gorgonzola or any blue cheese, gravlax, smoked salmon, sprats, smoked sardines, crab meat, lobster meat, smoked oysters, etc. Spread #3, Ham, Swiss cheese, slice of egg with pimento on top, parsley, sliced gherkin. Spread #2, Hard salami with pickle slice, egg slice on top of soft cheese. Spread #1, Egg slice, 1 or 2 Sprats, lemon zest, pimento. Spread #1, Salmon, capers, small piece of lemon, lemon zest. Spread #3, Swiss cheese, egg slice, pimento, pickle. Etc, etc, etc….Just use your imagination and use pictures as a guide. My spread for two people, Christmas 2009. Second plate is just out of picture on top right. One bite of any of these sandwiches will have you hooked! Note: For bread I always use baguette sliced about 3/8" thick on diagonal across for more real estate for toppings, but no bigger then what you can eat in two bites. Again, it is a personal choice.